Last year members of the Siberian Huskie Club spent many days rebuilding, repairing, and maintaining the trails within the park. 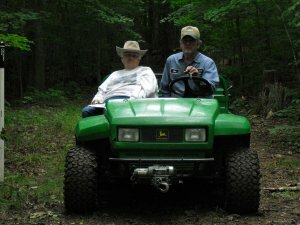 This year Friends of Punderson and Huskie Club members Don and Phyllis Pizmoht have spent many hours working on the 9 ¾ miles of trails in the park. 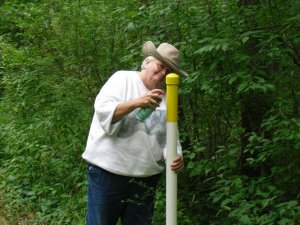 In the pictures, you can see Don has just finished installing a trail head marker for the Erie Trail. Phyllis is putting on the final touches to a trail marker for the Huron trail. These color coded markers are placed about ¼ mile apart on all trails. Each of the 8 trails in the park is color coded and a color coded trail map is displayed at each trail head. Enjoy your summer hiking these trails and when the snow flies you will see mushers and skiers enjoying them as well. Funds from the Friends Group paid for the materials. 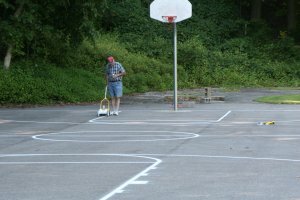 The court has long been in need of the final touch, the lines. However, cost estimates to have a striping company to do it were beyond our means. A solution was found and the project was funded by the Friends Group. The frequent rains delayed the completion of this project till early September. 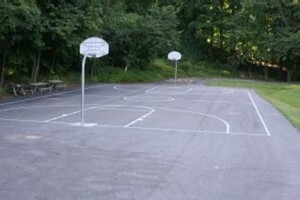 Here you see Friends member Marshall Hill finally lining the campground basketball court. The weather cooperated and the tennis courts by the Sports Chalet were done September 9, 2009. Friends of Punderson members Liz Hill and Beverly Fischbach enjoy the outside air as they plan for our Fall Festival. The Festival will have a Halloween theme. 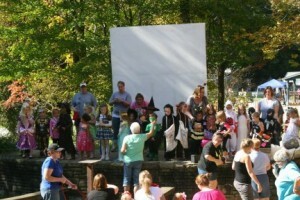 It will feature hay rides, games, Halloween crafts, trick or treating in the campground, costume contests, food, and more. 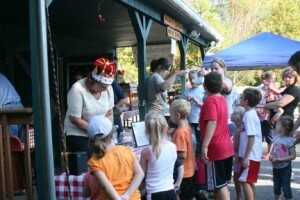 Set aside Saturday, October 10, 2009 from 2-9 pm and come join us by the campground Nature Center for some good old Halloween family fun. 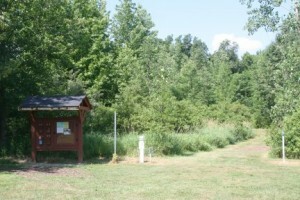 Construction of the 18 hole disc golf course began in early spring 2009. The Grand Opening for the first 9 holes will be October 10, 2009. Tom Mote and others will be maintaining the front nine as well as constructing the back nine during 2010, funds permitting. The course with its parking lot is located at the end of the first road to the right just after you enter the park.